OUH - Inst. Cancer Res. 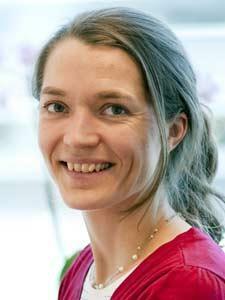 Kaisa Haglund, a project leader in Harald Stenmark´s group at the Centre for Cancer Biomedicine, has recently identified a novel regulator of cytokinesis, the final stage of the cell division process. In the June 2010 issue (published on-line 5 May) of Current Biology (journal impact factor 10.8), Haglund and her co-workers show that Cindr, the Drosophila homologue of mammalian CIN85 and CD2AP, is localised to intercellular bridges of dividing cells. It is also strongly associated with so-called ring canals, stable intercellular bridges that are formed through incomplete cytokinesis. Interestingly, Cindr co-localises and interacts directly with Anillin, a known regulator of actin filaments at late stages of cytokinesis, and depletion of Anillin or Cindr in vivo or in cell culture causes cytokinesis arrest and an increased number of binucleate cells. These results identify Cindr as a novel regulator of cytokinesis. Cindr (green) and anillin (red) co-localise (yellow) in the intercellular bridge between two dividing cells. Nuclei are stained white and microtubules blue. "Since incomplete cytokinesis has been associated with carcinogenesis, it will be interesting to investigate whether mammalian Cindr homologues or their interacting partners are dysregulated in cancer", Haglund comments.